Digitized archives of national mapping agencies are valuable assets for a number of usages. One is to evaluate hypothesis about a past state of earth –for example to assess the past presence of water sources based on old maps-, another usage is to observe dynamics – for example to describe urban sprawl based on series of images and maps- and to geo-reference documents that can be indexed and integrated based on their location in time and space. Last, a growing need is to provide a referencing framework in space and time for thematic digitized data, typically in the digital humanities or in the cultural industry. Besides, more and more data are being produced and the question of how to archive them efficiently is tightly related to the expected usage of the archives. Late 2014, EuroSDR started a specific initiative targeting the valorization of existing digitized archives of national mapping agencies and cadasters - following up the EuroSDR Archiving project - extended to any geodata that has been or will be replaced by newer one. A first seminar in December 2014 led to define a strategy comprising two facets. First facet was to reach out users to learn from them what are the priorities and requirements. Second facet was to share more elements between NMCAs’ good practices, and then maybe infrastructure components, datasets, servers, software, licenses, etc. but also with other actors. A follow up seminar targeted both facets through the focus on graphical interfaces. It aimed at presenting latest research and developments about graphical interfaces to interact with geographical historical data, at getting more insight on user communities’ requirements and fostering collaborations between national mapping agencies, academics and the industry in this domain. 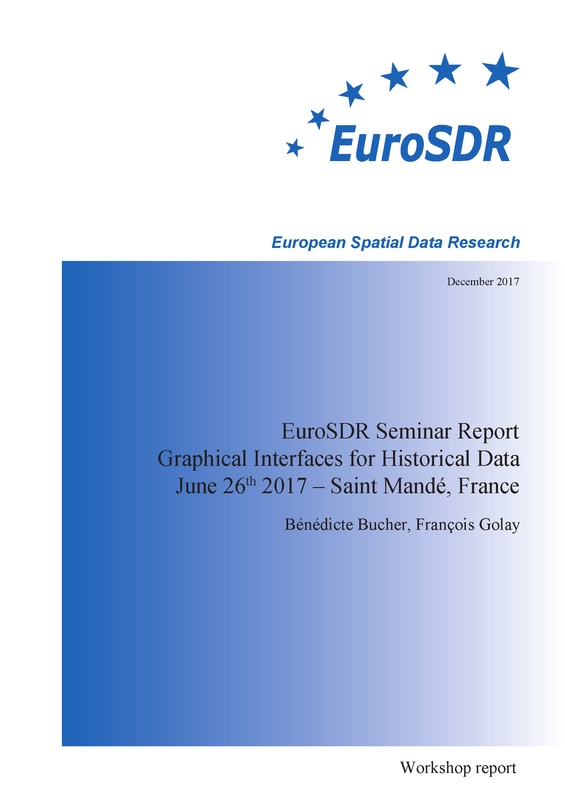 This report presents the highlights of this EuroSDR seminar of graphical interfaces for historical data, which took place in Saint Mandé (near Paris, France), on June 26th 2017. It was organized in three parts: presentations from national portals, presentations from research, discussions to draft a EuroSDR roadmap on graphical interfaces for historical data.